Rental reservations are available for advanced bookings through our website and reservations department at 1-877-359-8447. Make your Outer Banks vacation extraordinary with the ride of a lifetime on our 2-3 seater Jet Skis. Now open for the Summer Season at both Whalebone Watersports (Nags Head) & Duck! Make your Outer Banks vacation extraordinary this year with the ride of a lifetime on our Yamaha jet skis. Our jet skis can accommodate as many as 3 people at a time! The drivers must be at least 16 years old with proof of age to operate the watercraft. You must be at least 18 years of age to rent a jet ski and have a credit card to put down. Kitty Hawk Kites has 2 great locations for your jet ski needs on the Outer Banks of North Carolina. 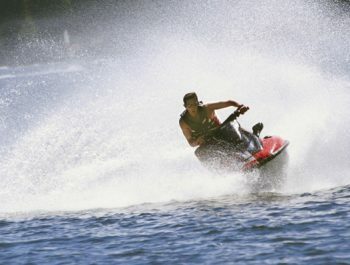 Don’t wait in line for your jet ski, reserve today by calling 1-877-FLY-THIS (359-8447). Are you interested in more than just a joy ride? Break free from the boundaries of the rental area on one of our Jet Ski Tours! Up to 2 riders per ski will enjoy the thrill of jetting across the shallow sounds, following your expert tour guide. 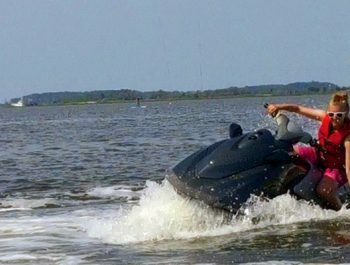 Everyone that has been on one of our Jet Ski Tours will tell you that there’s nothing quite like it on the Outer Banks! Located on the Causeway on the way to Roanoke Island from Nags Head (Hwy 64) this is a central option and is within 10-15 min of Manteo, Nags Head, Kill Devil Hills and Kitty Hawk. Located in the heart of Duck Village, this option is within 10-15 min of Kitty Hawk & Southern Shores and 30 min of Corolla.